This week, an unremarkable event can play a remarkable role to protect life in the Arctic. A part of the permanent ice cover on which life in the Arctic depends can soon be protected from destructive activities. If this protection is to become reality, a group of people must now make the right decision. 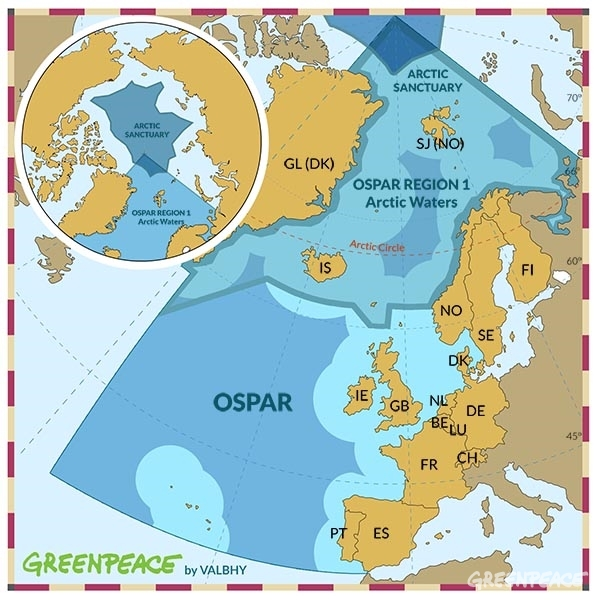 OSPAR is the name of a little-known, but very important organisation, in which fifteen European countries cooperate to protect the marine environment in a huge area of the sea stretching all the way from Spain to the North Pole. This week delegates from these countries meet in Gothenburg, Sweden, to discuss the establishment of an Arctic Marine Protected Area (MPA) located in the international waters north of Greenland. The area is pie-shaped, almost the size of the United Kingdom. The Arctic is warming at a rate of almost twice the global average and consequently is experiencing severe climate impacts – including the alarmingly rapid melting of sea ice. Some scientists warn the Arctic Ocean could have ice-free summers by 2030. This year saw a new record low level for Arctic sea ice extent during the normally ice-packed month of January. Some areas of the Arctic are projected to remain ice covered longer than other parts according to scientists. Polar bears use the ice for hunting and mating, walruses feed from sea ice platforms, and this is also where harp seals give birth to their pups to mention a few examples of why these areas are crucial for the Arctic ecosystem. It is crucial that these areas are protected from destructive industrial activities, as they could be devastating for the species dependent on this area for survival. Part of this area falls within the responsibility of the OSPAR, and this could be a potential habitat for ice dependent species in the future as the ice melts in other places. The negotiators that meet this week are set to put the final touches on a deal that will hopefully be agreed by governments later this year. Today less than 1.5% of the entire Arctic Ocean has any form of protected status. In international waters, the global commons belonging to all mankind, there is no protection at all. Protecting this piece of the puzzle is therefore a very important step towards saving the Arctic, and agreeing on this marine protected area should be a no-brainer. Yet, some countries are resisting. Although there has been strong support by the majority of the OSPAR countries, Norway and Iceland with the support of Denmark have blocked the process at several occasions. These countries argued in the past that the proposal was not rigid enough in its technical content, and that the protection of the Arctic should be dealt with in other fora. In recent months the technical aspects of the proposal has been significantly improved. OSPAR is currently the only international forum that is taking responsibility for the protection of the Arctic high seas. Any attempts to block the proposal with technicalities at this stage are therefore completely unacceptable. There is reason to fear that they in Gothenburg once again will try to stall the process. Having refused to participate in the process of defining the protection, they might present feeble technical arguments solely with the intention to delay the process, thus preventing any measures that are designed to protect the Arctic, which could stand in the way of their interest to exploit the Arctic. That is why Greenpeace will be on site this week in Gothenburg. Through an Arctic exhibition we will remind the delegates that even though they meet in a grey and dull room, they have the power to protect a beautiful place with an immensely rich ecosystem bursting with life. We will show the delegates that over seven million Arctic defenders are watching them, and expecting the meeting participants to deliver a final document ready to be approved by decision makers in June – which would ensure protection of the first international waters in the Arctic. Join us in our fight for the protection of the Arctic. Sign our declaration, and help showing the OSPAR delegates, that they can make history this week by setting Arctic management on a route towards protection for future generations.